Property 53: Volcanic landscape unique in the world! PATH OF THE SEA · Camino del Mar-Seafront Property! Property 54: PATH OF THE SEA · Camino del Mar-Seafront Property! The Saint. Tenesara. Apartment With Balcony. Property 58: The Saint. Tenesara. Apartment With Balcony. LA SANTA 3 Throw a stone into sea from Balcony! Property 62: LA SANTA 3 Throw a stone into sea from Balcony! 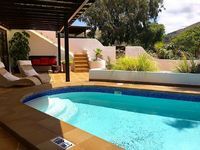 Property 80: Fajardo Villa - Volcanic Experience!